Mitchell 1 provides TPMS information to Modern Tire Dealer, an award-winning publication that writes editorial content geared to independent tire dealers. We’re sharing this content in our blog, with a link to the Modern Tire Dealer website where you can read the article in full. The TPMS information in this article may also be accessed in the reset procedures tab in our ProDemand® auto repair information software, along with other important reset procedure data for the selected vehicle. SUBJECT VEHICLES: 2008–2017 Toyota Highlander and Highlander HV. SPECIAL TOOLS NEEDED? Yes, a Toyota Techstream. The tire pressure monitoring system (TPMS) of the 2008–2017 Toyota Highlander and Highlander HV is designed to provide warning when the tire inflation pressure of one or more road tires is low. A tire pressure warning valve sub-assembly equipped with tire pressure sensor/transmitter is installed in each tire and wheel assembly. The sensor measures the air pressure and internal temperature of the tire. These measured values and the transmitter ID are transmitted to the tire pressure monitor antenna and receiver assembly on the body via radio waves. This data is then sent to the tire pressure monitor ECU from the tire pressure monitor receiver. If the transmitter ID has been previously registered, the ECU compares the measured air pressure value and the standard value. When the value is less than the standard value registered in the tire pressure monitor ECU, the tire pressure warning light on the instrument cluster will turn on. 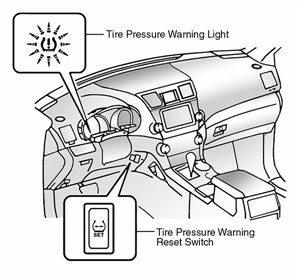 In order to reset the warning threshold in response to changes in tire pressure values due to tire type and installation position changes, a tire pressure warning reset switch is used. This switch is used to initialize the system after certain repair procedures.